When Carlisle was faced with devastating floods for the second times in 10 years, independent electrical wholesaler, David Freshwater, of Premier Electrical Limited, galvanised the industry into action. Once the cameras, politicians and visiting Royalty had been and gone, the community faced the immense task of clearing up after Storm Desmond – something that will take at least a year. 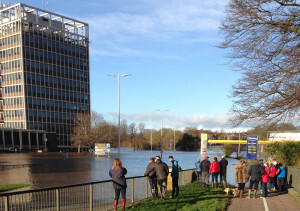 After flood defences failed, around 3,500 homes were left under water, along with the council offices and much of the city. Swinging into action, David got on the phone and persuaded a number of companies to help, including Ansell Lighting, Wylex, JCC Lighting, Collingwood, Lumineux, Osram, Manrose, BG, MK and DETA. Continues David: “They very generously sent free goods which we have been distributing to uninsured victims to help ease some of the pain.